Lists of the above species can be viewed by clicking on the relevant links to current pdf files. The list of Flowers includes everything which is not a shrub, tree, grass, sedge, rush, typha, moss, liverwort or fungi. 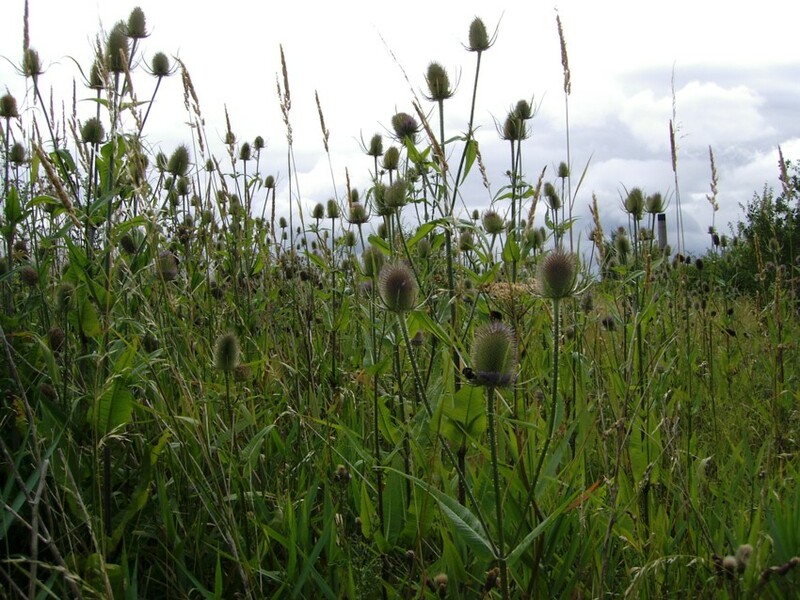 An unusual plant to be found on the Reserve, possibly a remnant of past cultivation or seeding from the dredging desposits. A tall climbing perennial, up to 6m, with male, branched yellowish-green flower clusters and globular female flower clusters on separate plants. The fruit is the familiar pale green cone-like structure. Close examination will show a square stem and clockwise twining. With broadly heart-shaped deeply 3 or 5 lobed strongly toothed leaves the flowering period is July to September. Photograph is of male flower from No.2 Bed on 09/08/2017 - female plants can produce male flowers if stressed but only the female flowers develop into the familiar Hop cone. 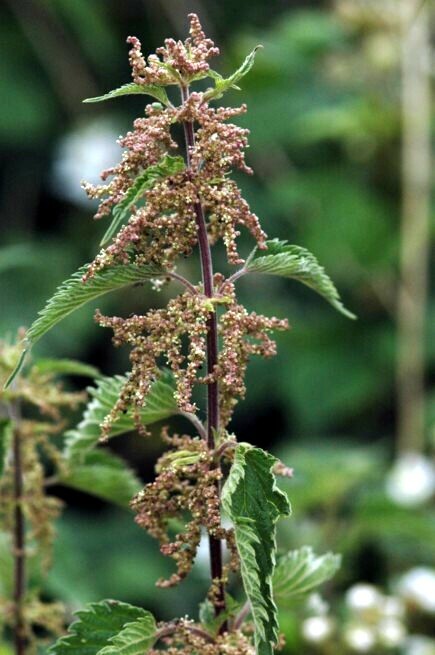 Known by its other common name, Stinging Nettle, this plant is widespread throughout the Reserve and universally recognised, once stung. A medium to tall plant with generally heart shaped strongly toothed leaves, the small yellowish-green flowers form drooping clusters from the base of the upper leaves from June to September. Rare on the Reserve but noted on the banks of the River Mersey. A parasitic plant found on tree boughs, typical hosts being apple and popular. Has pairs of leathery pale yellow-green leaves in a well branched form, typically spherical looking. The green flowers are small and insignificant from February to April but the white fruiting berry from November to February is very recognised with its association with Christmas. A common plant on the Reserve, found in the damper and moisture retentive areas. A medium tall plant with smooth unbranched stems and blunt triangular shaped, stalked, lower leaves but small triangular upper leaves which ‘sheath’ the stem. 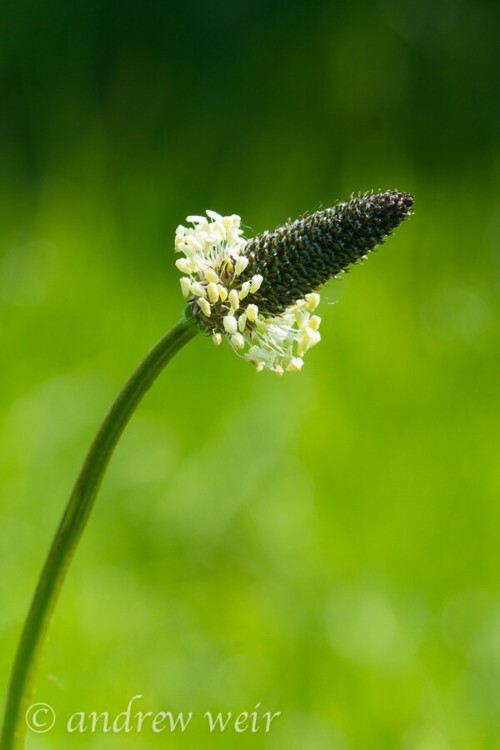 The flower head is a solitary dense cylindrical spike of individual flowers circa 40mm long from June to October. 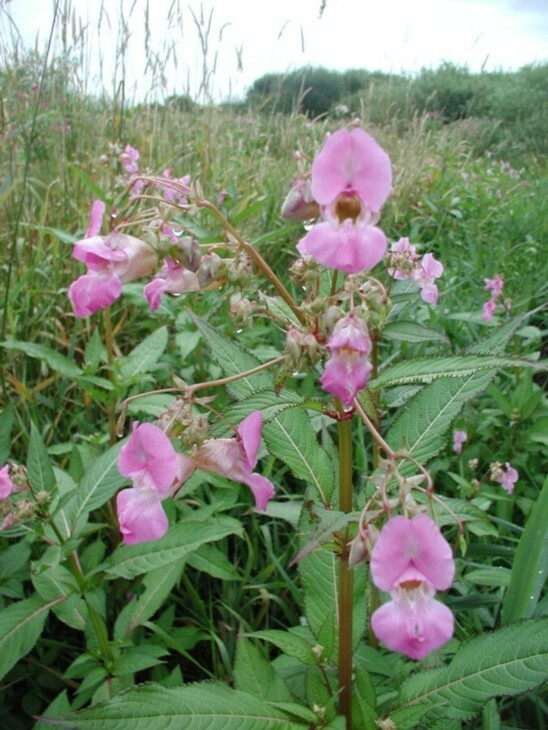 Prefers its roots in water which is where it is found on the Reserve at the water margins of ponds and ditches. A sprawling perennial floating and hairless, with rooting nodes at leaf junctions. Leaves oblong and do not taper at the base as in Bistort above. 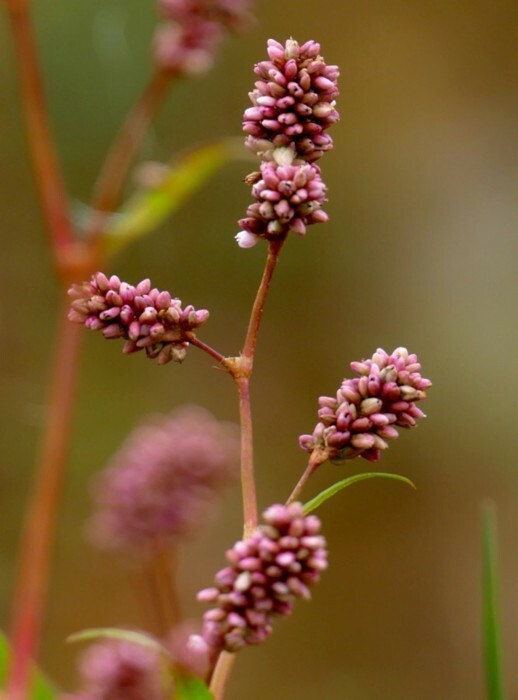 The flower head is a dense spike of small pink flowers similar to Bistort from June to September. Widespread over the Reserve on bare and recently disturbed ground, especially close to water. A sprawling branched annual with lnceolate leaves, typically with a dark centre spot either side of the mid-rib. 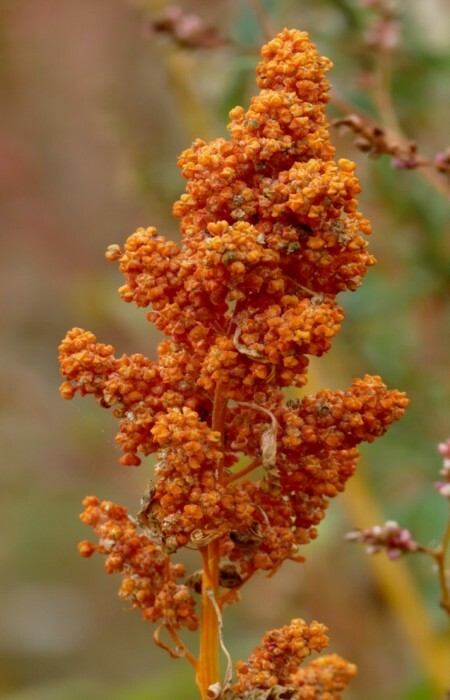 Pink to whitish flower spike from June to October which develop to glossy black seeds. Widespread around the Reserve on poor soil and bare ground. A low sprawling branched annual with lanceolate leaves reducing in size up the stem with noticeable stipules which also sheath the stem giving an overall zig-zag appearance. 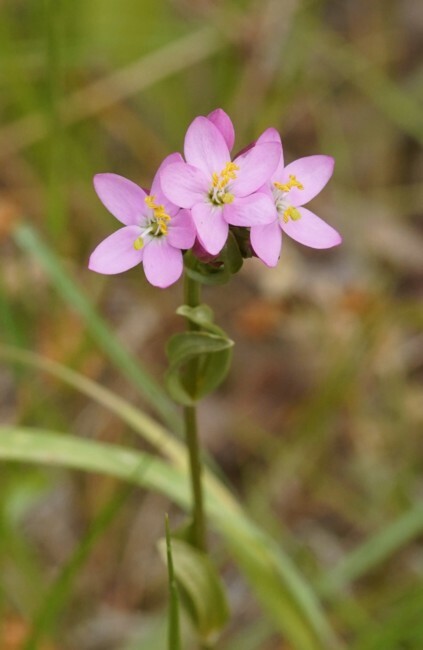 The small pink to whitish flowers are usually solitary at the base of the upper leaves from June to October. Found on the Reserve in a few isolated stands. 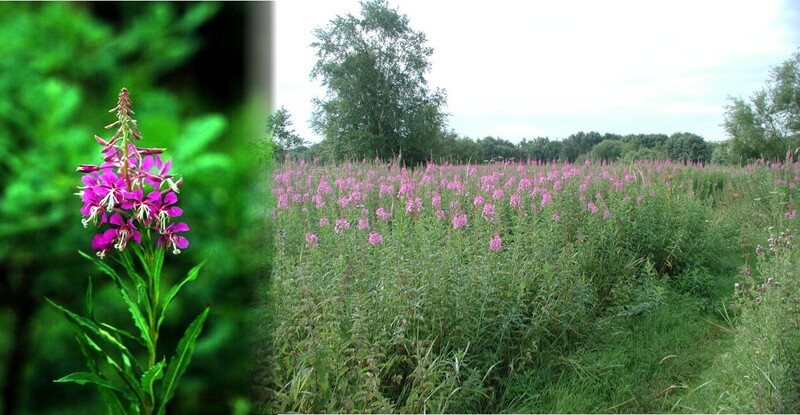 A large invasive perennial difficult to eradicate and forming dense stands up to 2m. Stout hollow stems with reddish hue and zigzag appearance. Leaves are broad triangular with wide base from which the loosely clustered and branched white flower spikes rise in August to October. Common plant, abundant around the Reserve. Short to tall perennial, with arrow head shaped leaves, the lower stalked but the upper leaves much smaller and clasping the stem. The flower head is loosely branched with reddish-green-yellow flowers in whorls from May to August. Similar plant to the Common Sorrel found on bare dry areas. This is a short perennial again with arrow head shaped narrow leaves but the lower larger leaf lobes point forward rather than backward in Common Sorrel. 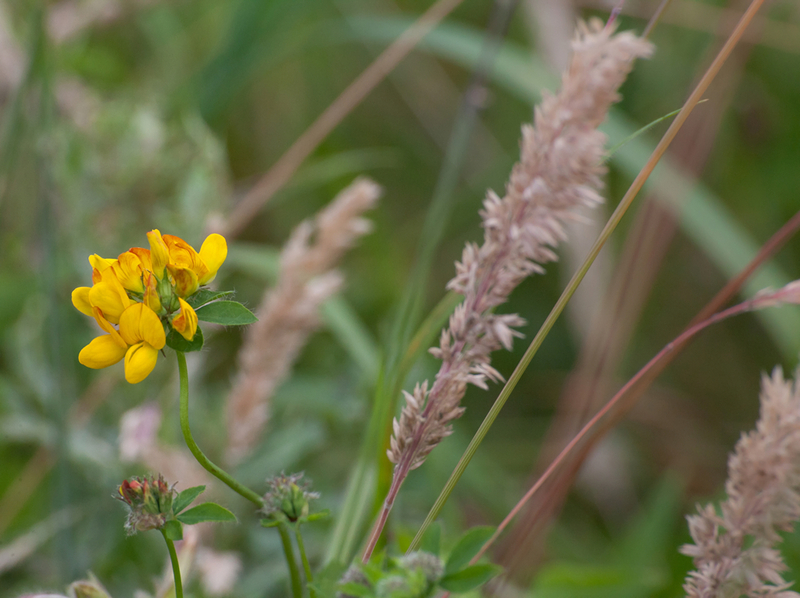 The flower head is similarly little branched with reddish-green-yellow flowers arranged in whorls up the spike from May to August. A tall perennial plant of uncultivated, bare and disturbed ground. The leaves are large and broadly oblong, the lower rounded or heart shaped at the base. Flowers from June to October, the spikes consisting of small reddish-green-yellow flowers arranged in whorls up the branched stems. Much less common than the Broad-leaved Dock but localised over the Reserve. 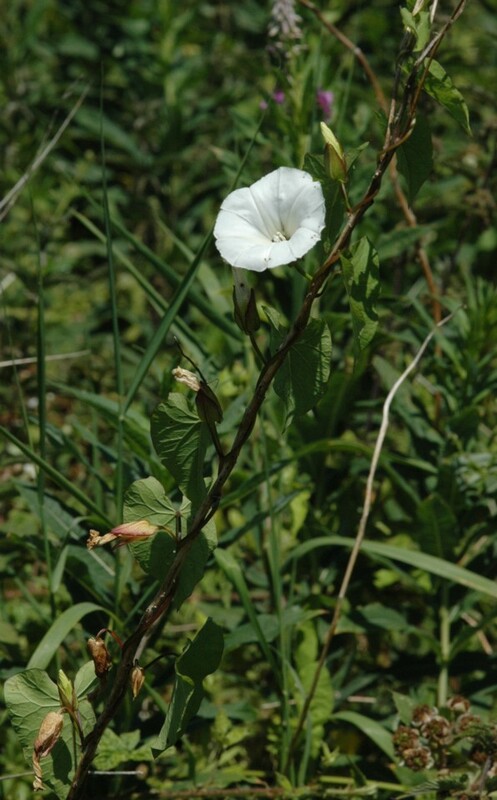 Very similar looking plant to the Broad-leaved Dock but the leaves are narrower and exhibit wavy edges and merge into the stalk without the obvious rounded heart shaped base. Tall green plant covered in a silvery-grey mealy covering and often reddish hued stem. Leaves are variable being diamond to lanceolate and generally toothed. Flowers are green forming dense clusters originating from the upper leaf joints from June to October. Recorded on No3. Bed in the bird feed meadow. A variable plant, erect or spreading in nature, hairless with oval leaves generally untoothed. Stems often reddish and square, flowers greenish in dense and loose clusters July to October. First recorded in the survey of 1995-96 by Rosalind Martin. A sprawling prostrate hairy annual found in dry bare places. Leaves are oval, unstalked and opposite on the stems. 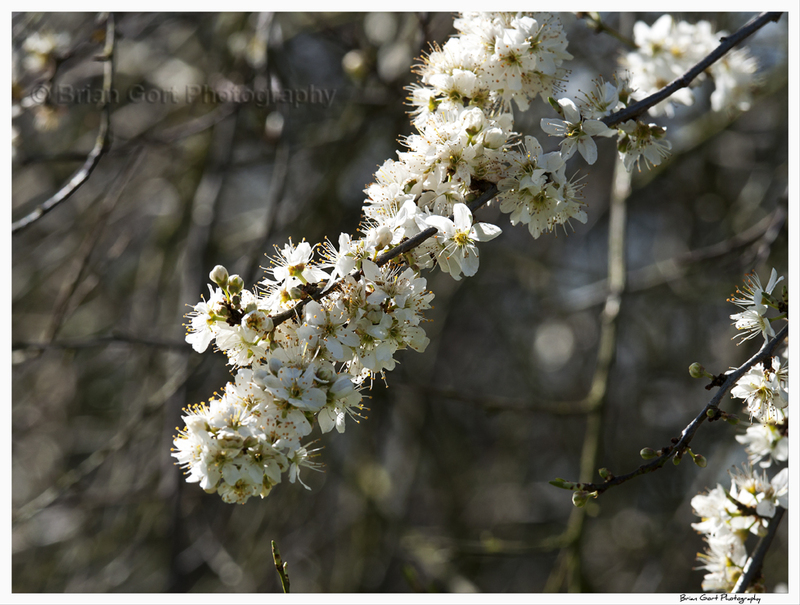 Flowers white, 5-8mm set against green sepals and yellow anthers from April to November. Found in shadier places, hedges, banks, wood margins on heavier soil. Found in shady places in woody areas, amongst hedges and thickets. A low perennial, hairless with a single white (sometimes pinkish hue) flower 20 to 40mm across and yellow anthers to the stamen. Leaves are stalked and deeply lobed, characteristically three lobes arranged in a whorl of three leaves below the flower which is from March to May. A vigorous and scrambling dense patch forming woody biennial, variable in size, spreading via rooting runners. Heavily protected with thorns on all stems, stalks and even leaf midribs. Leaves prickly with 3-5 leaflets, stalked. Flowers 20-30mm 5 petalled white sometimes pinkish. Fruit develops from green to red then purple-black when ripe. The familiar blackberry. Found over the whole Reserve. Low creeping with stems often reddish and up to 1 metre rooting at leaf junctions. Leaves commonly have five leaflets but up to seven can occur with untoothed stipules and stem leaves stalked. 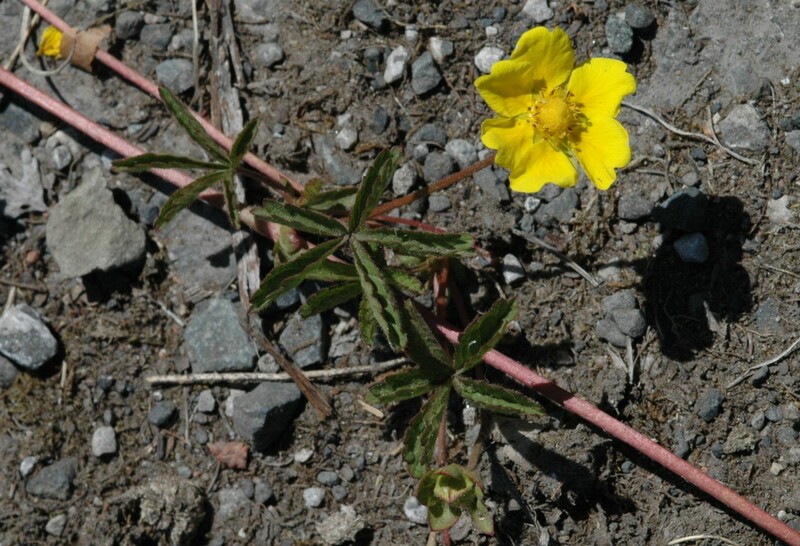 Flowers are bright yellow solitary with five petals and sepals, compare with Tormentil which commonly have four. Flowers from June to September. Found on bare waste places especially on hard track edges around the Reserve. Widespread across the Reserve in shorter grassy areas. Variable erect/low hairy perennial. Unmistakable three leaved leaflets often with whitish crescent present. Flowerheads globular, usually unstalked 20 to 40mm across of varying shades of pink-purple, May-October. Flowers develop into brown seed heads. A low creeping perennial with trefoil leaves more or less hairless. The leaflets often have a white crescent mark. Flowerheads white globular (sometimes pinkish) and long stalked around 15-30mm. Widespread across the Reserve, favours shorter grassy areas, edges of paths and tracks. Flowers May-November. 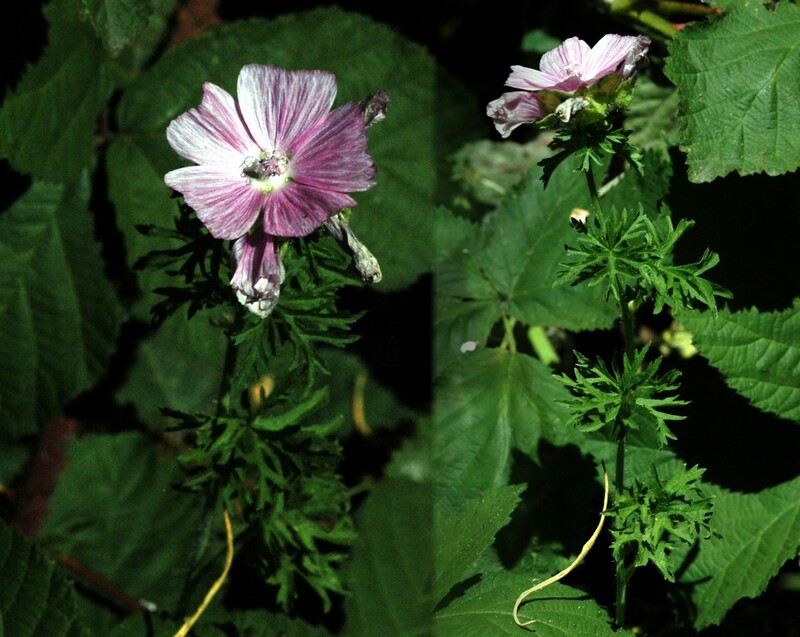 A medium to tall perennial with notably deeply and narrowly cut leaves separates it from the other common Mallows. Flowers are rose-pink 30-60mm across five petalled on unbranched stalks. Flowers July-August in grassy places across the Reserve. Tall, forming dense patches. Pinky-purple flowers with white stamens, 20-30mm, held in a triangular spiked raceme. Leaves are lanceolate and alternate decreasing in size up the flower stalk. Flowers May-September. Widespread across the Reserve in loose and large dense stands. Favours well drained grassy places often sandy. Variable low/short annual with elliptical leaves in a basal rosette but with a few stem leaves which are opposite, narrower and shorter. Flowers are pink, 5 petalled, almost unstalked, usually in a tightly packed clusters but occasionally singular or pairs. Leaves are 3 to 7 veined. June to September. Creeping and climbing perennial to 3 metres or more. More or less hairless all over with large arrow shaped stalked leaves. 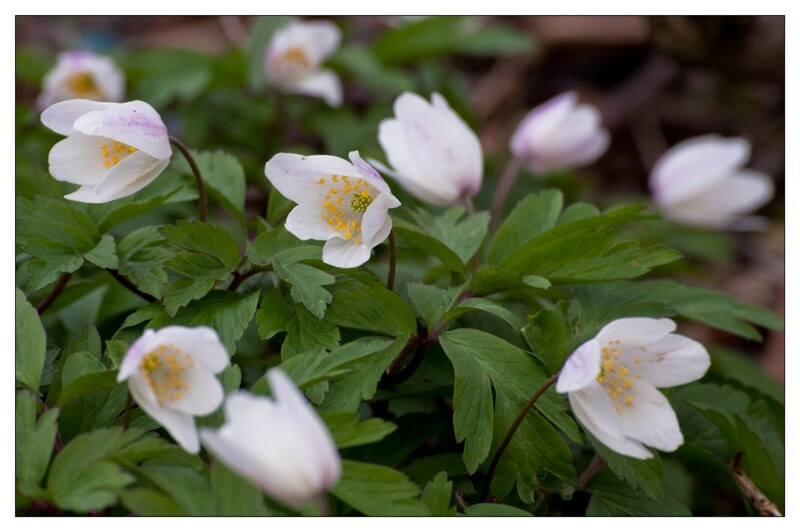 Flowers are white, rarely pink, 30-35mm across. 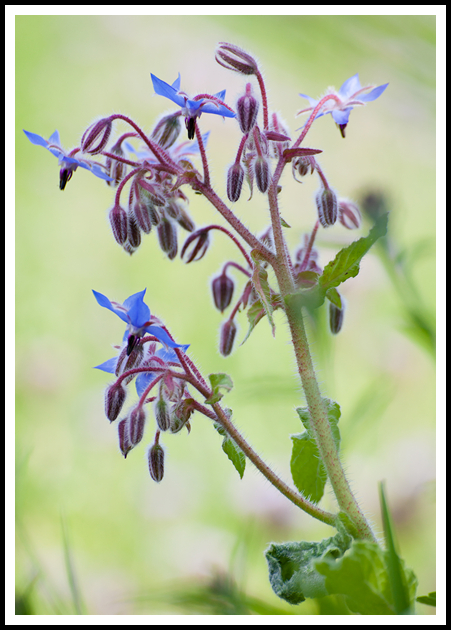 Two large but not overlapping bracts enclose the 5 narrower sepals. Compare Great Bindweed with larger 60-75mm flowers and two very large overlapping bracts which hide the smaller five sepals. Flowers from June to September. 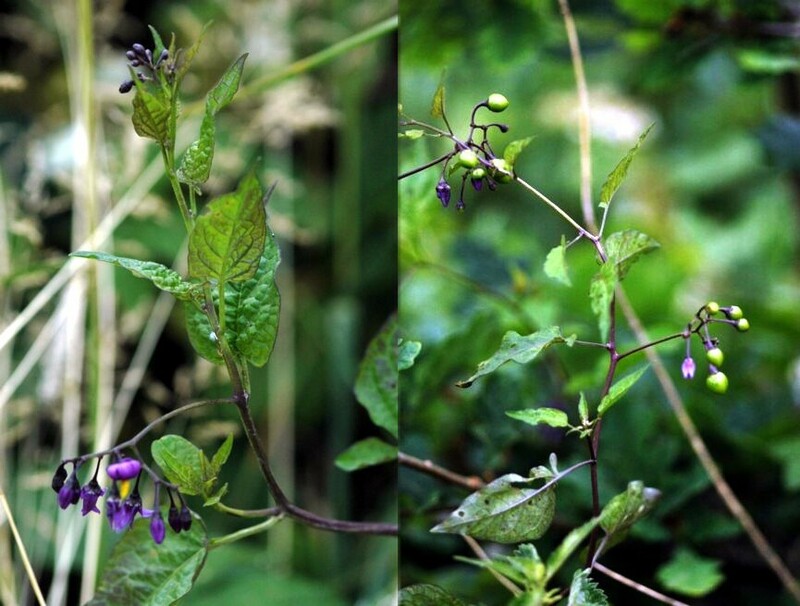 Found in bushy, waste places and small hedgerows climbing through the underlying vegetation. 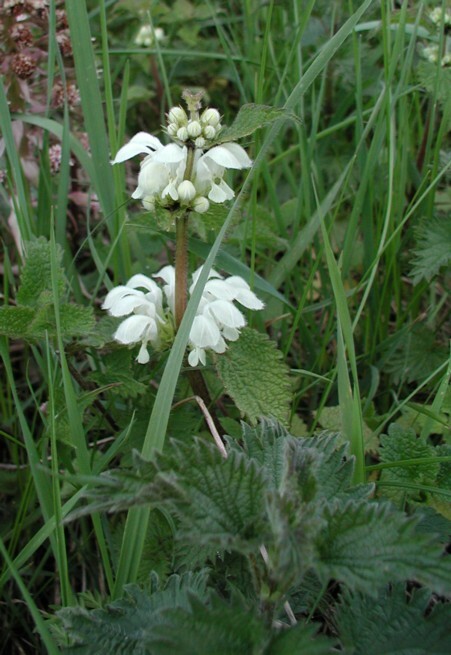 A short hairy creeping perennial with vertical unbranched flower stalks with heart shaped stalked leaves toothed at the margin soft to touch with no sting as the similar looking Nettle. 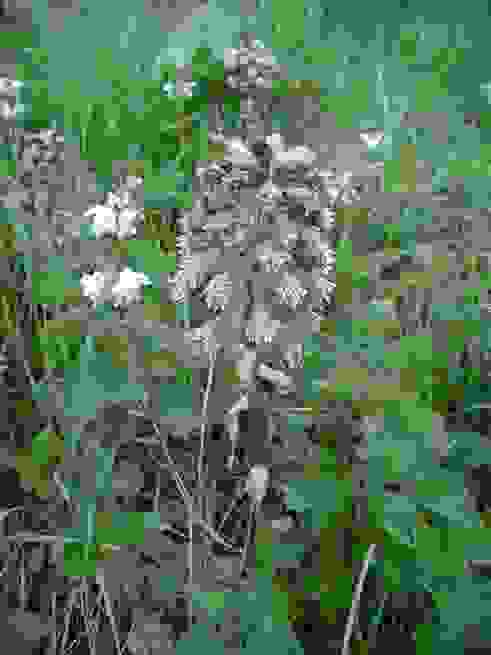 Flowers are white, 2-lipped and open mouthed, 20-25mm with small greenish streaks on the lower lip if looked at closely. In whorls around the stem at the base of the paired opposite leaves. Usually early flowering from March but can be much later in the year. Located in pockets around the Reserve on all four beds. 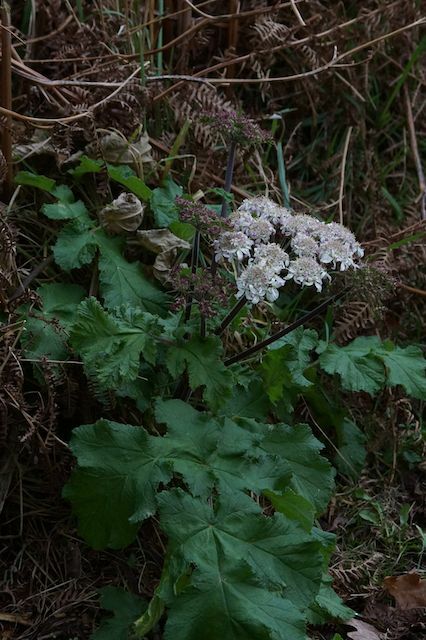 Weak clambering perennial up to 2 metres. 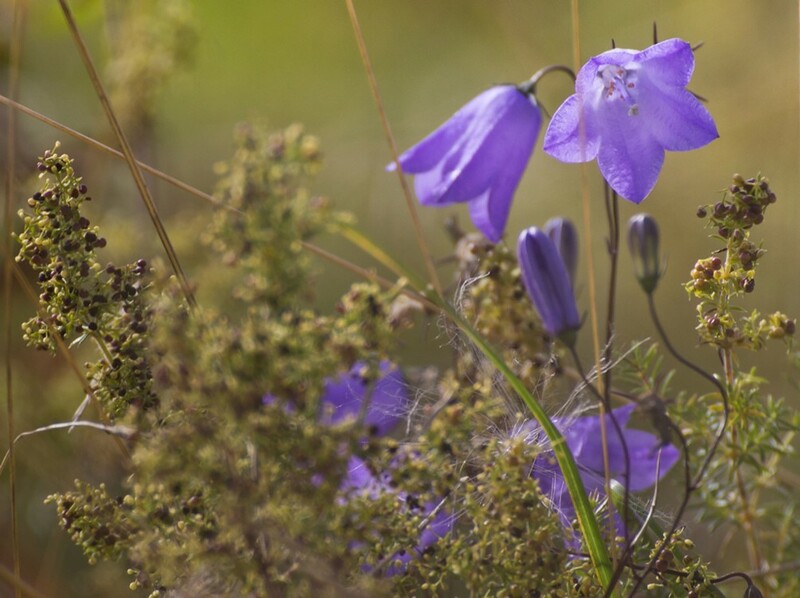 Five petalled deep purple flowers with yellow anthers held in a central column in loose clusters, May-September. The purple petals turn back further exposing the yellow anther columns. Leaves are pointed-oval with or without 2 lobes at the base on the lower leaves. 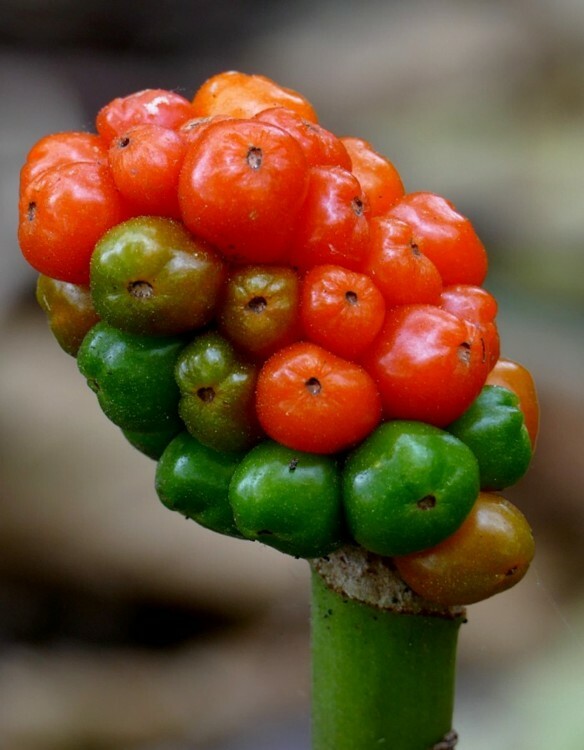 The slightly ovoid fruiting berry is at first green then yellow and finally red when ripe and is poisonous. 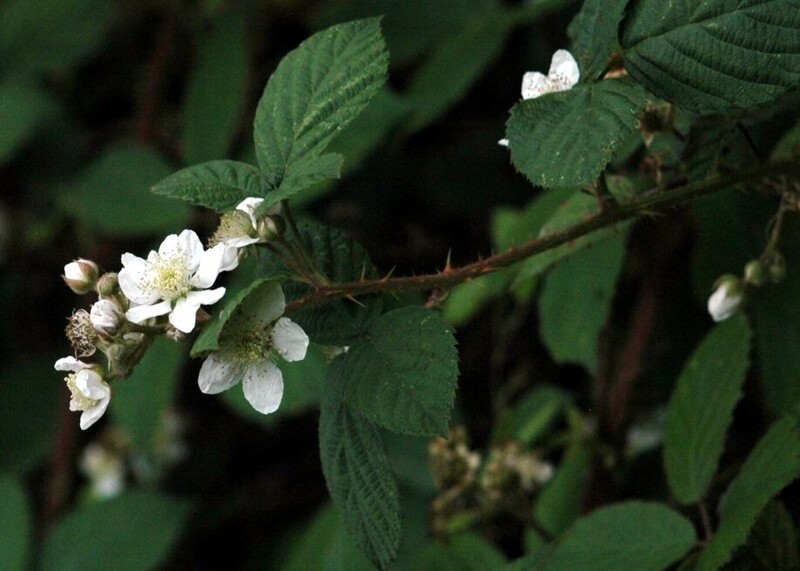 Is not common on the Reserve but can be located in bramble stands, hedges and open scrubby areas. A tall perennial up to 1.5m with downy broadly lanceolate wrinkled leaves decreasing in size up the flower stem. 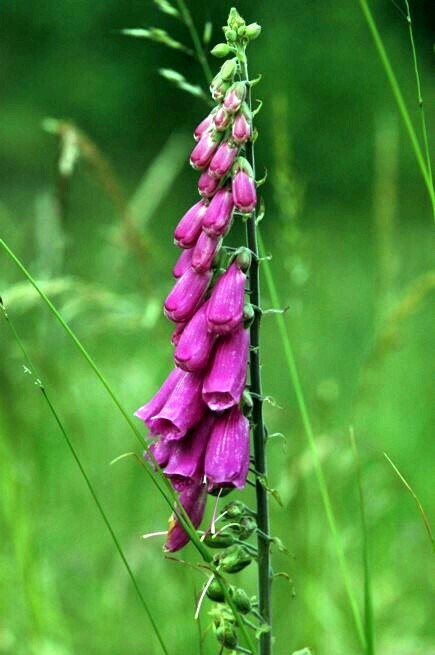 Unbranched long tapering flower spike of generally pinky-purple two lipped tubular flowers, occasionally white. Widespread across the Reserve on all four beds June-September. A robust medium to tall plant 40-100cm with spiny winged stems and pinnately lobed leaves with stiff, straw coloured spines. The flower heads are large , 20-40mm across, red-purple with spreading spiny bracts. Flowers June to September. Found across the Reserve alongside access tracks and bare, waste/grassy places. Was first recorded on 16th May 2014 on the South Meadow area of No3 Bed and not recorded anywhere else. It is a perennial with grass like leaves which are grooved with a central white strip emanating from the roots and is hairless. 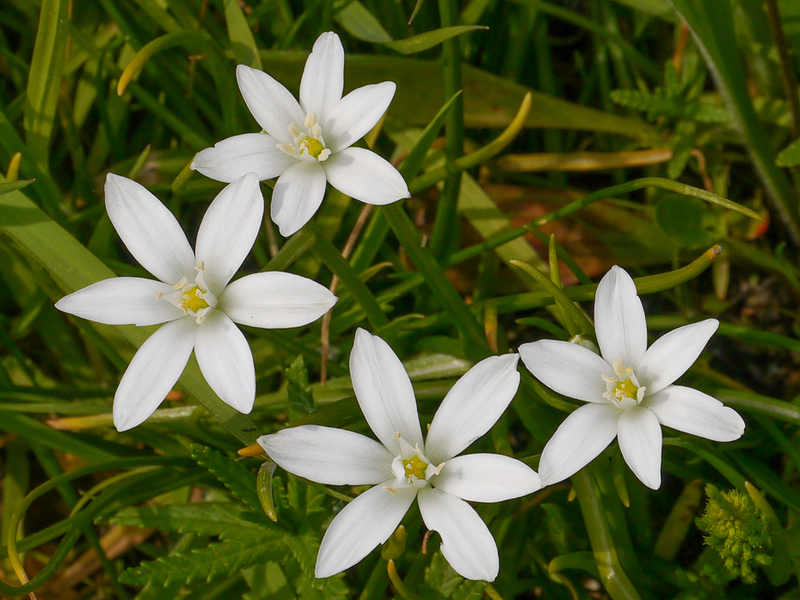 The flowers are white, six petals with a green stripe on the back, in a loose umbel-like cluster on a leafless stem. 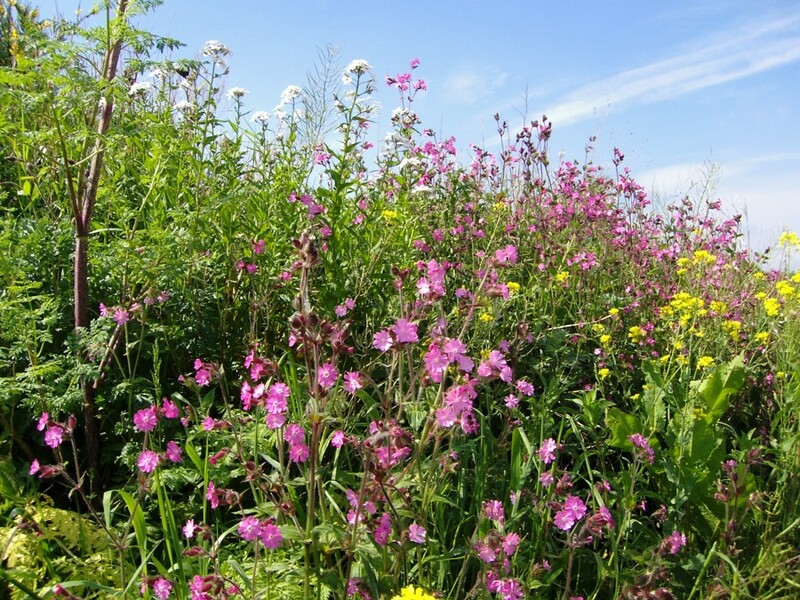 Flowers May-June in grassy and cultivated places. 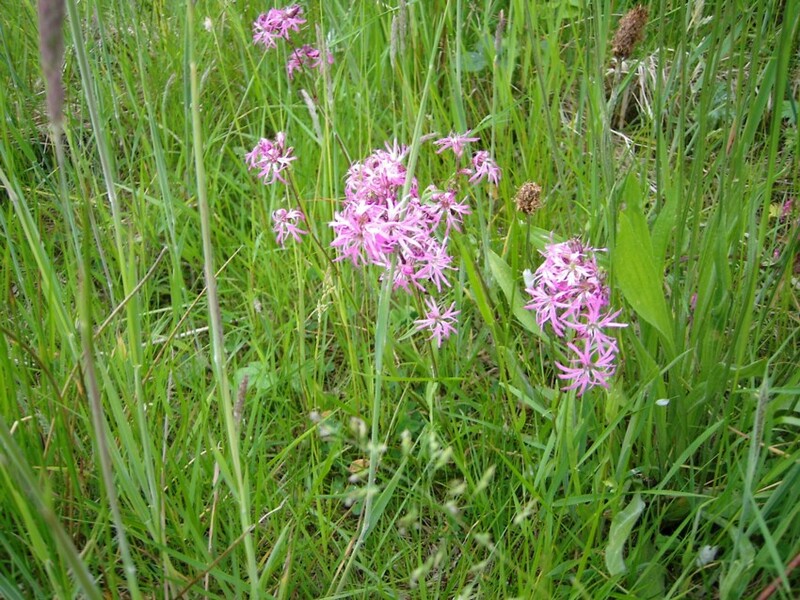 Has been reported in the meadow areas of No.3 Bed in recent years. A roughly hairy medium tall annual with pointed oval shaped leaves, the lower stalked, with wavy edges. 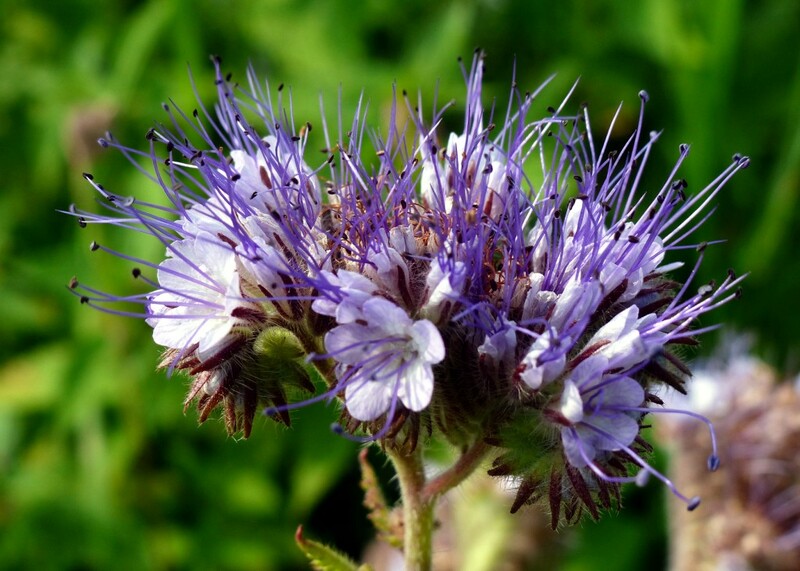 The flowers are bright blue, circa 20mm across, held in loose drooping clusters, with narrow green, turning purple, sepal lobes and have a central prominent dark purple stamen column emanating from the white flower centre. 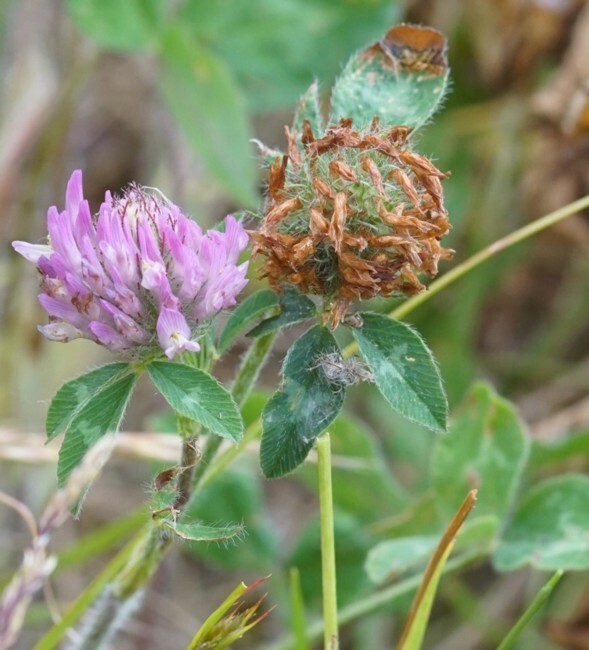 Flowers may-September on rough ground, waysides and waste places. It is perhaps relevant here to define ‘what is a Shrub’ and ‘what is a tree’? - Only plants with woody parts are trees and shrubs. As with everything in life however, there are exceptions. Some trees may have multiple trunks. 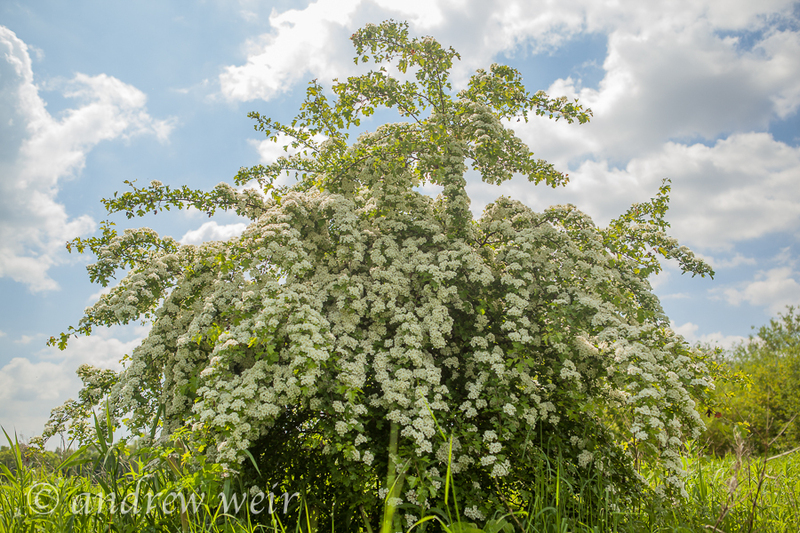 Some shrubs can be shaped into a small tree by training one trunk. However, as long as the ‘general definitions’ are followed, you should be able to decide whether the plant is a tree, a shrub or neither. A03 Goat Willow - Salix caprea agg. A09 Oak sp. - Quercus sp. A10 Elm sp. - Ulmus sp. Mosses and Liverworts are the little green ‘jobbies’ we often notice but ignore. The most important feature of mosses and liverworts is that they have no vascular system. A plants vascular system is a series of tubes that can transport water and nutrients over a distance, technically the xylem and phloem. Without a vascular system, mosses, and liverworts cannot grow very large. The ‘plants’ we see are actually carpets of many individuals and not a single plant. They require water to reproduce and have no root systems so need water droplets to survive which is why they are associated with moist and damp environments.They are known as the bryophytes. Mosses are simple waxy little plants with no leaves and no stem that use each other to stay upright. Liverworts are even simpler than mosses. These are considered to be the simplest of all plants and often grow flat along the ground in large leaf-like structures. A common ‘cup’ fungus in Britain, on clay soils and disturbed ground in late summer and autumn. They usually grow in clusters and tend to develop irregular shapes, due in part to the crowding nature of growth, and can flatten and split. They are smooth, shiny and bright orange on the inside of the cup and downy white, when fresh, on the outside, becoming increasingly smooth and orange with maturity. The cup size is 2-10cm in diameter and around 2-4cm high without any visible stem or stipe. The flesh is orange when cut and the spore print is white. The most iconic of British fungi and one of the least likely to be confused with any other fungus. It is toxic and has the distinctive bright red cap with white scales found in a variety of woodland habitats. When first erupting from the ground litter they are completely white and covered in spikey warts. As the cap grows and expand the bright red cap skin (pellicle) shows through until the cap consists of mainly red skin with the white wart scales more or less even distributed over the whole surface. The cap starts off convex but flattens with maturity and grows to 10-20cm and stands around 10-20cm high with a grooved white stem ring. The white wart scales can weather to leave just a red cap. The gills are white but gradually turn yellowish with maturity and the spore print is white. Family: Amanitaceae - Species: Amanita sp. 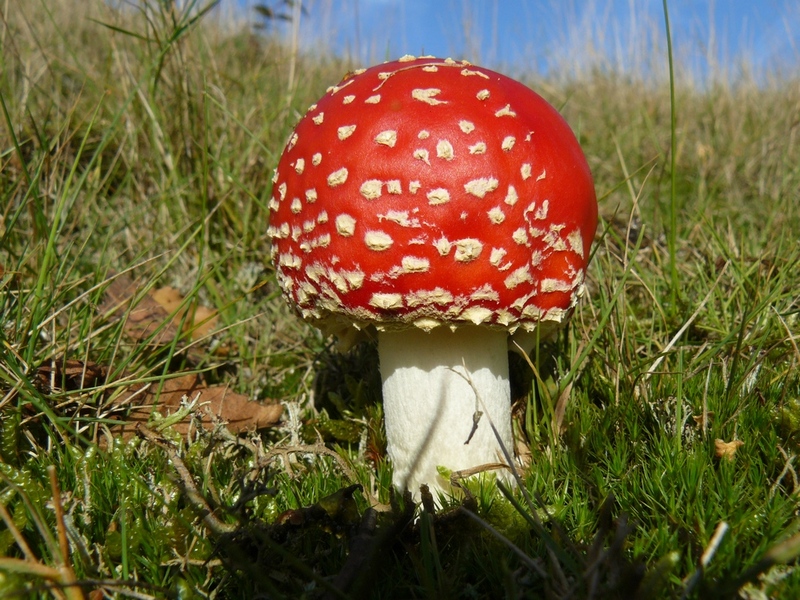 A species of Amanita, Agarics, was found which was not ‘muscaria’ (Fly Agaric) or ‘vaginata’ (Grisette). Initially egg shaped the caps expands to become flat, 5-10cm diameter, but always with a small raised central area (an umbo)and is grey coloured. The edge of the cap is striated (with comb-like radial ridges). Below the skin the flesh is white and firm and the gills are white. The stem height is 12-20cm and 1 to 1.5cm in diameter, tapering only slightly at the cap and is white or tinged with the grey cap colour. The stem usually becomes hollow as the fruiting body matures. There is no stem ring on this Amanita species however, at the base there is a large white sack-like volva. The spore print is white. 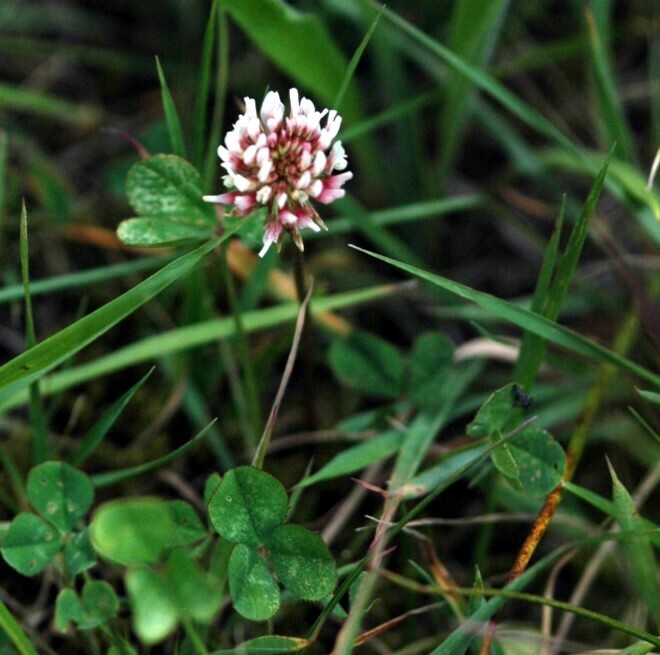 Widespread and common throughout Britain, most noticeable in autumn. The cap is between 5-15cm diameter and ranges from honey-yellow to red-brown but always with a darker area towards the centre. Initially convex the caps flatten and often develop wavy edges with maturity and when young fine scales cover the cap but do not always remain evident. The cap flesh is white and firm. The gills are flesh coloured turning yellowish and finally developing rusty spots with maturity. The stems are also white when young but fade yellowish to yellow-brown have a pale yellowish stem ring and are around 5-15mm in diameter and 5-15cm tall with a fine woolly surface. The spore print is very pale creamy white. The name Honey Fungus has nothing to do with the taste, some records make reference to the colour of the fungus itself but collecting a few and tying them in a polythene bag and left in a dry warm place will reportedly replicate the smell of honey. They are also bioluminescent but very weakly so. 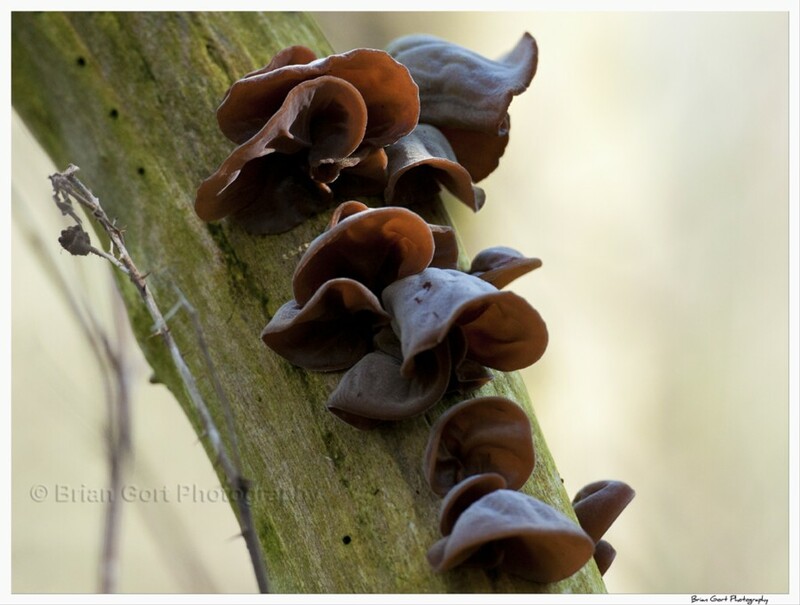 Fairly widespread and frequent in Britain, the Jelly Ear fungus is seen mainly, but not exclusively, on dead Elder wood in damp, shady locations. It is best looked for in late summer through autumn although they can be found all year round. The outer surface of the lobed fruiting body is tan-brown with a purple tinge and covered in a fine greyish velvety down but the inner surface is smooth. Individual lobes grow between 3-10cm across. The spore print is white. Photograph - no Woolston image available. 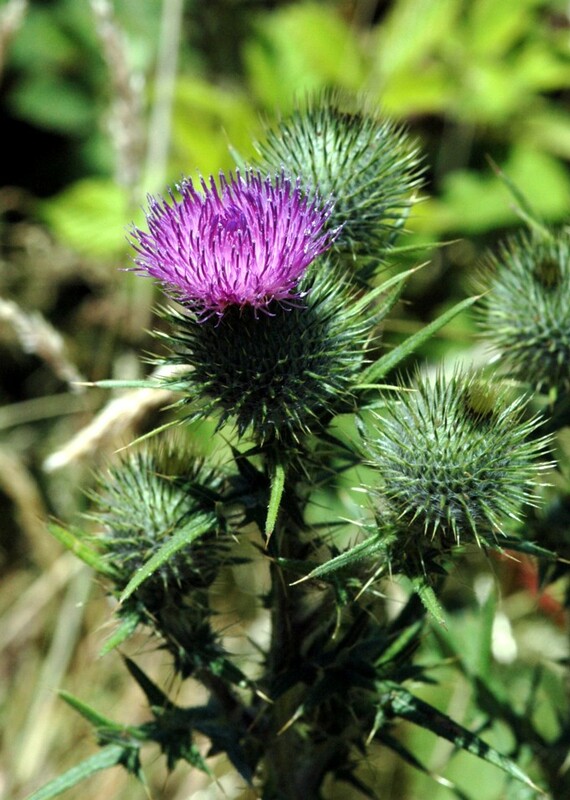 Widely distributed but localised in England, tending to coastal regions in Wales and scarce in Scotland. Found on wood and thick plant stems and on first sighting resemble small flowers more than a fungus as the fruiting bodies form clusters of pure white to yellowish cups and tapered funnels. 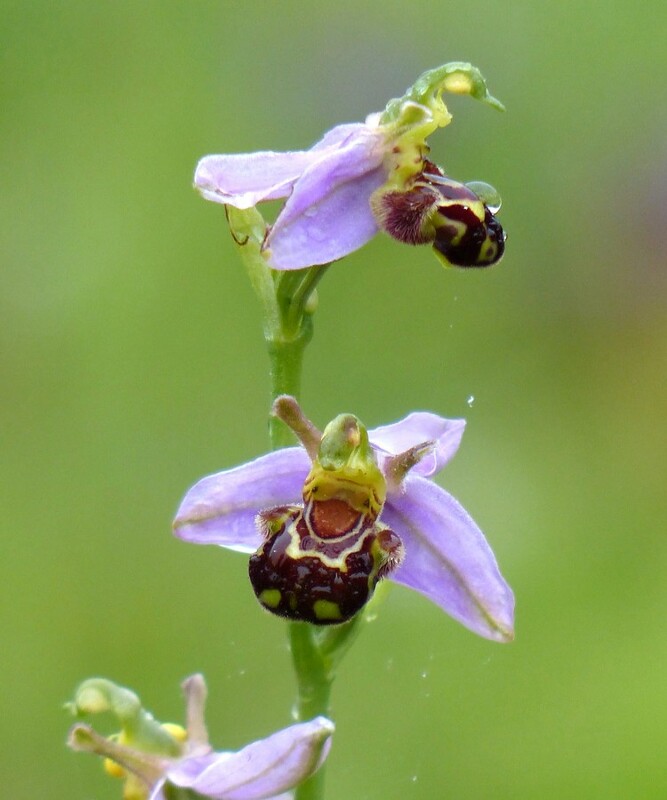 They have a smooth outer surface and are around 1-3mm long and up to 4mm in diameter hanging on the underside of branches, twigs and stout stems or drooping from the shrub or plant stem itself. 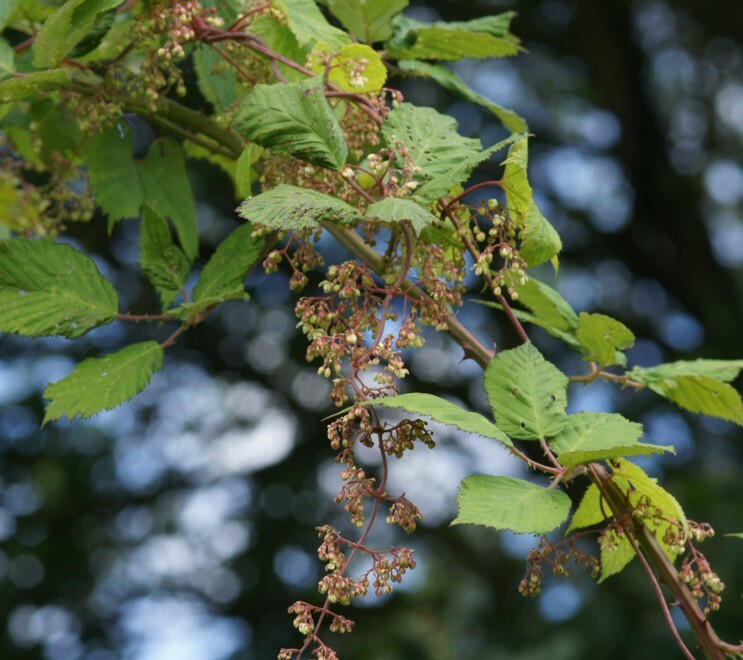 The fungus, infrequent but widespread in Britain, attacks wood and is evident on the leaves of deciduous trees and shrubs, especially fruit trees, roses, Hawthorn, Poplar, Maple and Oak, which develop a silvery sheen in summer. Following the appearance of the silvery sheen, affected branches die. Can be detected by cutting across a branch showing the silvery leaf sheen, an irregular dark stain may be seen in the centre, not necessarily corresponding to the heartwood. The leathery fruiting bodies appear from late summer through autumn. These start as just a crust on the wood but develop into intergrowing brackets around 3cm broad being lilac to deep purple patches with white edges and fine pores on the under-surface. Similar silvering symptoms may sometimes develop as a result of non-disease forms of stress. This is known as false silver leaf and can be told apart from true silver leaf by the absence of stain in the wood when cut. 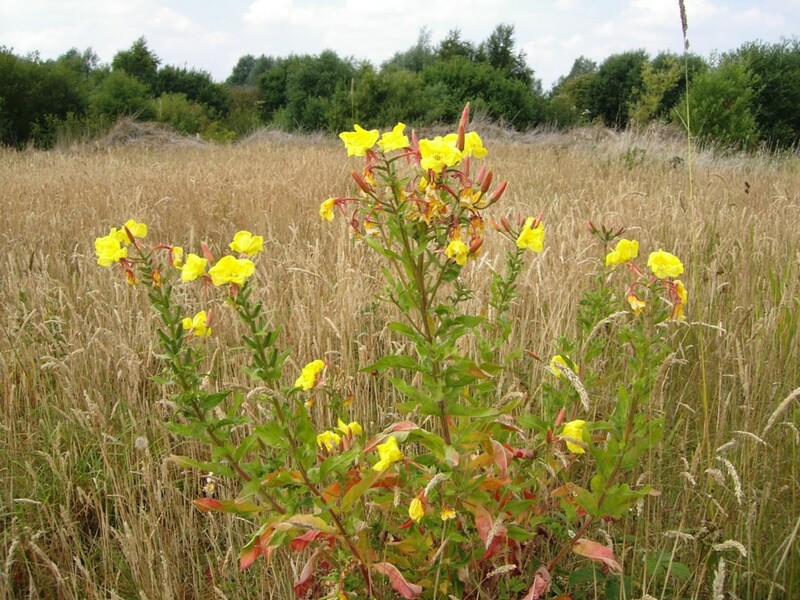 Widespread and fairly common in Britain on unimproved grassland type habitats, from June to November. Simple white worm like protuberances around 2-10cm tall and 4-5mm across. These fingers are more often straight with rounded tips but can be slightly flattened, wavy and/or forked near the tip. Close examination will often reveal longitudinal grooves in the surface. The tips yellow with maturity and finally turn brown with age.The spore print is white. Localised and rather rare in Britain. 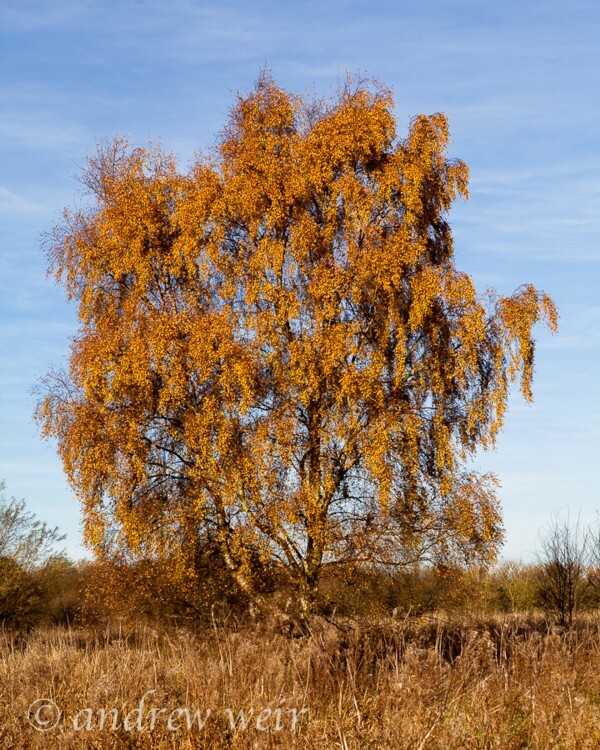 occurs on dead branches of living deciduous trees, especially Hazel and Birch over the winter period. Is basically a simple club shaped fungus, occurring singularly or in tight clusters, which become twisted and irregular protuberances of pinkish-brown, pale-brown colour and around 4cm in height. Flesh is yellowish and firm. Very widely distributed and common in Britain. 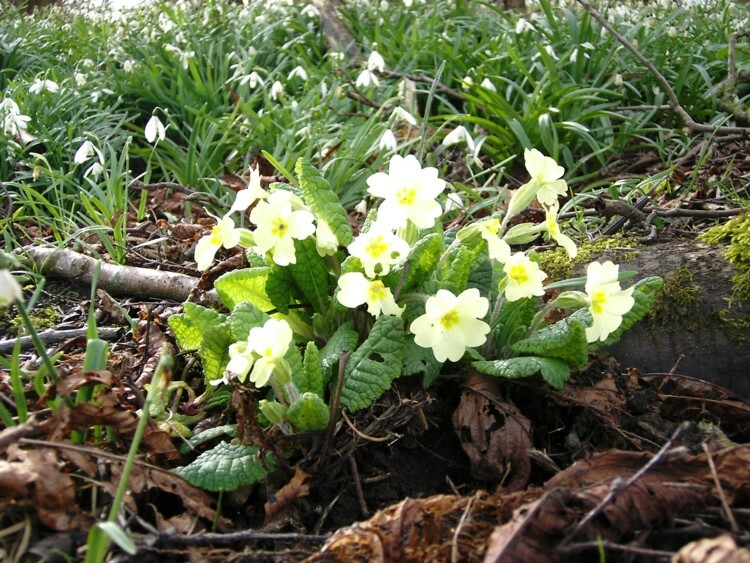 Generally occurring in woodland habitats but can be found in rich humus soil conditions away from woodland. Typically an autumn fungus can be very late with fruiting bodies, sometimes in January. Is gregarious and forms large ‘fairy rings’. The cap is convex, around 4 to 9cm diameter and later usually funnel shaped with a wavy in-rolled margin; smooth and matt; tawny or orange-brown. The caps turn paler as they gradually dry out, eventually becoming buff. Tawny Funnels that appear very late in the season sometimes have convex caps that do not develop central depressions - a cause of confusion. The gills start white but become tawny with age. The stem is 3-5cm high and around 0.5-1cm thick, downy at the base, no stem ring and slightly paler than the cap. Spore print is creamy-white. 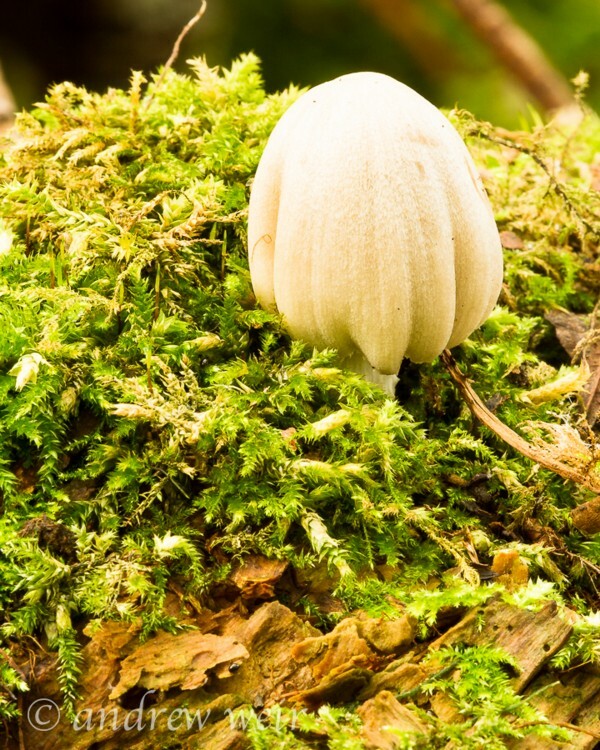 This is a widespread and common mushroom in Britain from autumn to early winter. It gets its vernacular name, not from a visual aspect, but from the greasy, buttery, feel of the cap which is 3-7cm diameter and with a distinct centre bump, ‘umbo’. It is very variable in colour but is generally a ochre-brown, which pales with age and with a cream edge around the cap. The stems are tough and flexible around 1.5cm diameter and the same colour as the cap and has no ‘volva’ at the base or stem ring. Photograph – no Woolston image available. Family: Bolbitiaceae - Species: Conocybe sp. Conocybe is a genus of mushrooms with Conocybe tenera as the ‘type’ species. Most are quite delicate with a long thin stem and a conical shaped cap and are collectively known as ‘cone-heads’ because of this. 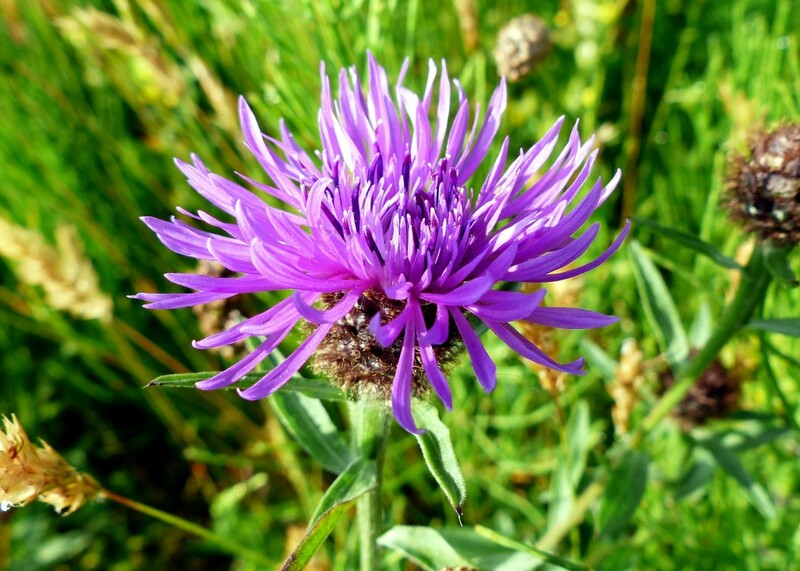 They are common in more fertile habitats as grassland, moss, dung and decaying wood. The ‘ink caps’ are named from the crude writing inks that were obtained from the decaying caps. Common Ink Caps are widely distributed and frequent in Britain from late summer through to early winter. They are found on a variety of decaying deciduous trees and buried wood. They are usually found in clusters but can be solitary. The caps are grey to pale-brown, browner at the cap centre, around 3-7cm diameter, and are conical when young but flatten and disintegrate to a black inky fluid. The stem is white-grey, 15mm diameter and around 7-17cm tall and the gills are white-grey but rapidly turn black. The spore print is dark brown. This is a distinctive fungus which is unlikely to be confused with other fungus families. It is widespread and common in Britain from April to November. The shaggy cap is a long, white cylinder with shaggy, upturned, brownish scales. The gills are whitish, turning pink then black before liquefying from the rim inwards. The entire mushroom is very fragile and crumbles easily. The older it gets, the shaggy part start to gradually dissolve into a black, inky fluid, leaving only the standing stalk. Grows to 10-15cm tall. The stem is 10-15mm thick, white, hollow and brittle with a white stem ring which often detaches and slips down the stem. The spore print is black. Very common and widespread in Britain, found from August to November and found in clusters, often very dense, massed around old stumps or buried wood of deciduous trees. The cap starts as a conical bell with pleats, 5-15mm in diameter and stand 10-20mm high but flattens with maturity. They vary in colour only slightly from a pale buff-brown to clay grey and are very fragile and suit their synonym ‘Fairies Bonnets’. The gills start white, turn grey-brown and eventually black, but they do not dissolve into black ink as other Coprinoid mushrooms. The stem is white, bare, thin, hollow and easily damaged. The spore print is black. Widespread and common in Britain, found from April to October associated with dead and buried wood. This is a bell-shaped fungus which usually occurs in small groups with a cap reaching 20-40mm diameter, creamy-ochre coloured which darkens towards the centre and often has radial grooves. The cap is covered with a glistening powder. The gills are white when fresh becoming purple-brown and then black before liquefying. The stem is brittle and hollow, brownish at the base, around 5mm diameter and 4-10cm tall. The spore print is very dark-brown or black. Common fungus around woodlands throughout Britain especially under Oak and Pine trees. A large mushroom with a cap around 4-10cm in diameter, convex at first then flattening and developing slightly depressed centes in maturity. They are reddish-purple around the cap rim (note: older specimens can be bleached of colour on the rim) deepening in colour to purple and very dark towards the center. The gills and thick even stem are white to creamy in colour. The spore print is ochre. This family is notorious for pin-pointing the precise species from the 20-30 often referenced in field guides. Suffice it to say Russula are reddish but sometimes orangish or yellowish and no attempt to separate will be made in this summary. The general species description is they have a convex to flat cap, around 8-10cm diameter, with white or creamy gills underneath and a smooth white stem around 10cm high and fairly even thickness of 2cm. The cap colour will be left as stated above. It is widely distributed and grows on damp humus, common around pine trees. 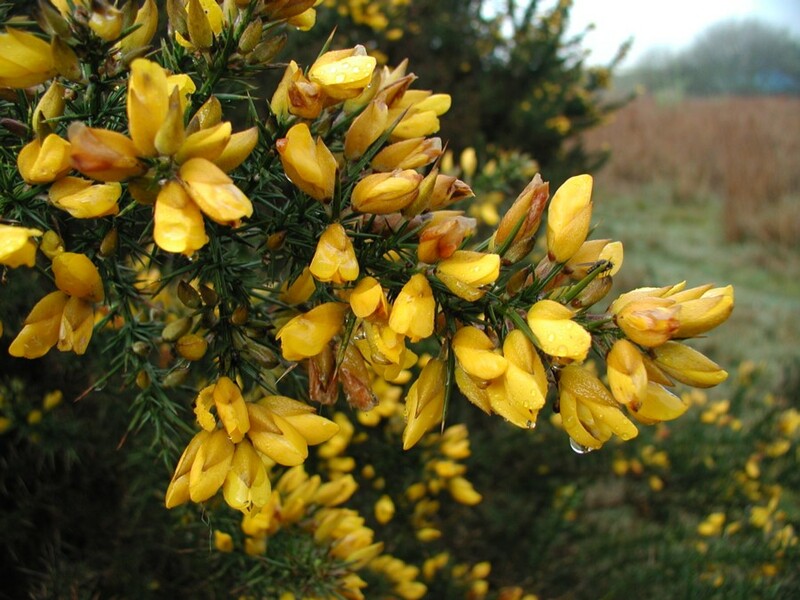 Fairly frequent and widespread throughout Britain, found on fallen branches and twigs especially partly buried in moss, most abundant in late autumn and winter. It forms a generally round but irregular shaped cup from 2-7cm diameter and 1-2cm high with the edges often curling inwards. The inside of the cup is bright red and smooth, the outside is paler and covered in fine hairs. Observed under strong magnification these are in the form of tangled coils which is diagnostic for this species. The related Ruby Elfcup has tangled straight hairs. A common fungus of woody and short grassland areas around 40 to 100mm in diameter found from July to December. The roundish ball of the body has no stem and is initially whitish, cream or yellow and may turn brown or greenish on aging. It is covered with coarse scales of irregular shape and size. The body skin ruptures on maturity leaving an irregular opening from which the spores emerge via wind and rain assistance. Empty earthball skins can persist for months in sheltered locations. The inside of the ball is white at first, turning brown with white marbling before turning purple-brown throughout. Found on rotting wood and other humus rich damp habitats and is widespread and common in Britain from late spring to late autumn. 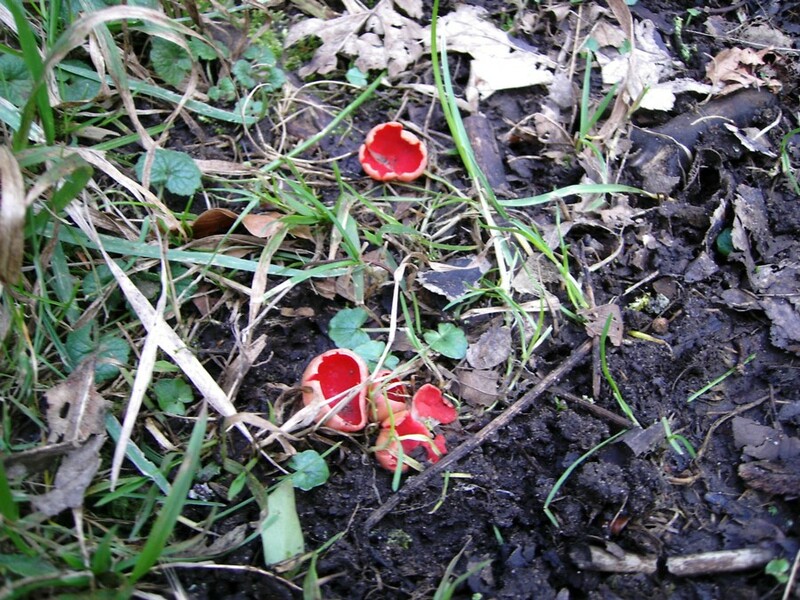 The visible fruiting bodies form small red cups, 3-10mm diameter, which open and flatten in maturity. They have distinctive long dark hairs, ‘eyelashes’ on the outer edge which are visible but clearly so under a magnifying glass. The cup center is orange-red and browner on the outside which is covered in stiff dark hairs up to 10mm in length which resemble eyelashes on the cup rim. The flesh is red and thin. One of the fourteen Stereum species occurring in Britain which was not identified to a specific species. They are simple small bracket shaped membranes appearing on dead wood. The underside contain spore but no gills as ‘cap and stem’ mushrooms. They can be split into two groups those which exude a reddish liquid (blood) at cut surfaces and those which do not. This is one of only a few green-blue fungi and is very localised in Britain, mainly on alkaline humus. The bell shaped caps are uniform coloured much nearer to green than blue and are very slimy when new and noticeably glossy, standing out amongst the general floor litter. With age they gradually flatten, size between 2.5-8cmm diameter, and the colour pales to brownish-tan from the centre outwards. Small white veil fragments can be seen on the cap and its rim, more noticeable in younger specimens. The stem is pretty much uniform in diameter up to the cap and has a brownish ring below which the stem is covered in fine white flakes/scales. Spore print is purple-black. A very widespread, common and conspicuous fungus on Sycamore and other Maple leaves which does very little damage to the living tree but can cause premature leaf drop. It appears initially as yellow blotches on the leaves in spring. These develop into slightly raised , shiny, black spots dotted over the leaf surface. The outer edge is usually bordered brown and is around 10-15mm across. Usually associated with pine woods it does however occur with deciduous trees as Oak, Birch and Willow. It is widespread and common in Britain. It resembles a rosette-like fan with the upper face reddish-brown to dark-brown, often paler at the margins and with darker banding in the rosette. There is no stem to speak of, a rudimentary one at best, and grows to 6 -15cm diameter. The underside of the rosette is lighter brown to mid-brown. The spore print is purple-brown. Principally found in the autumn-winter period on fallen deciduous trees and branches which has already been attacked from other wood rotting fungi and is widespread and common throughout Britain. It is a bright yellow jelly fungus and mature specimens resemble the convoluted folds of a human brain sprouting from decaying wood. 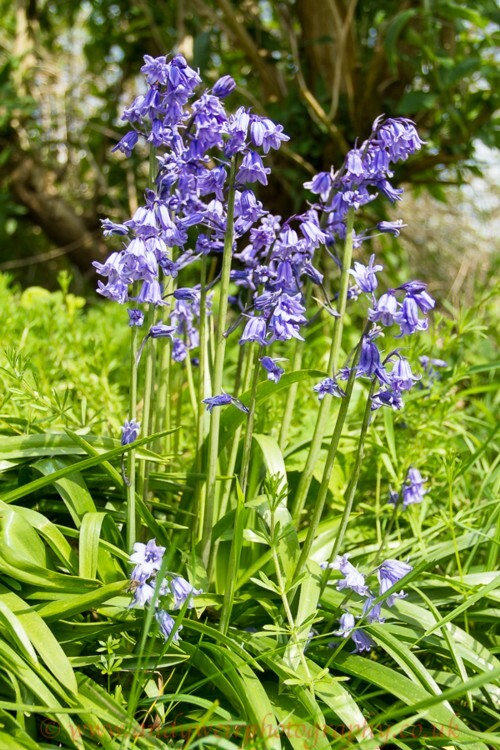 It is best looked for in wet weather as in dry spells it shrivels to a hard rubbery patch on the wood which is more difficult to pick out. One of the 50 known species of Tricoloma found in Britain which was not separated to a particular species. The general characteristics of the family are; fleshy, white gilled mushrooms. The cap is often connected to the stem by means of a small notch. Colour varies from yellowish to greys and through to browns. Fairly common throughout Britain. Occurs as single specimens or in groups associated with rich humus such as woody, grass and other organic mulch. Has a white to greyish cap, paler at the cap edge graduating greyer and brownish to the centre. Initial bodies are ovoid, like an egg, but the cap becomes convex and even flattens around 5-10cm across. The cap is smooth but slimy when young, sticky when moist and silky when dry. The stem white, around 10-15mm diameter tapers towards the cap and is without a stem ring but retains a volva, baggy sac, at its base. Usually reaches around 50-90mm in height. When cut the flesh is white throughout. The spore print is pink. This is an unmistakable fungus occurring in groups and is best looked for in the winter months. It is a fungus of dead and decaying wood, mainly deciduous but sometimes also pine. A black fungus which throws up fingers up to 50mm through the substrata which develop white powdery tips from late autumn and over the winter period. These fruiting bodies branch to resemble ‘antlers’ or ‘candlestick’ forms as the fungus develops. On maturity, in early spring, the white coating disappears leaving the spikes/antlers all black. This fungus is bioluminescent, although a very weak source and is also called, Candlestick Fungus and Antler Fungus, descriptions no doubt connected with their visual form. Photograph - no Woolston image is available. The following species list is certainly not exhaustive as indicated by recent small scale surveys in 1990 and 1995/6 when almost 50 additional species were recorded giving a total of 215. The list does not give any indication of the relative abundance of each species. The presence of a species is denotes by a “1” or a letter in the body of the table. The “80” list is taken from “AN ECOLOGICAL SURVEY”. The location of the plants was not given. B - flora on the area to the East of No.1 bed before it was lost to waste disposal. The “83” list was abstracted from an article by D McNaughton published in the 1983 Annual Report. T from “Trees along the Mersey” by P J Nichols. It has been assumed that the trees were planted on the Eyes! The “90” list is from a survey carried out by the “CHESHIRE CONSERVATION TRUST Ltd”,(organised by Mrs E M Nall) on No.3 bed in the summer of 1990. The “N” indicates new species found on that bed and “1” confirmation of the species already mentioned in the “Management Plan” list. The “96” list shows the new/interesting species found in a survey carried out by Mrs R Martin in 1995-6. We are indebted to the Rochdale Field Naturalists for the following information. They made two visits to the reserve in 2001, and a further visit last November. The main areas covered were the lower footpath between no2 and no3 beds, the woodland adjacent to the footbridge /canal and on the island itself. Fungi were more scarce due to poor weather conditions last autumn.